Researchers from the RUB clinic Bergmannsheil announced today some very promising results for patients requiring a partial bone removal in their lower leg, like cancer victims and people with serious injuries. 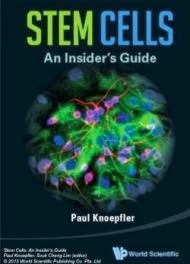 The researchers say, that stem cells reduced the time required for growing one centimetre of bone from an average 49 to 37 days. In their announcement, the researchers explain that in the past it was common practise to amputate a leg or an arm with large bone defects. Today, another approach is followed. 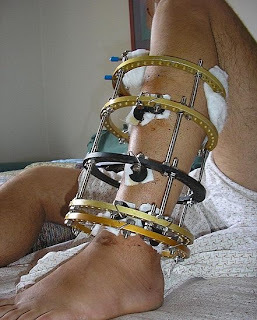 The limb is stabilised using a special external fixation device called "Ilizarov ring fixator" which is attached around the leg. This device promotes new bone growth, and the bone gap is gradually filled. Unfortunately, the healing process is extremely slow, taking months or even years in some cases. The RUB researchers say that they have been experimenting, since 2009, with autologous, adult stem cells extracted from bone marrow tissue to accelerate the healing process. During the procedure, the surgeons first extract about 60 millilitres of liquid from the iliac crest of the patient using a hollow needle. The liquid is then centrifuged and concentrated in order to remove certain blood components, increasing the concentration of stem cells and growth factors which are both important for bone regeneration. Next, the researchers add a coagulating agent to the 8-10 millilitres of liquid left by the previous step. Finally, under X-ray guidance the liquid is injected into the bone gap. As of now, 20 patients have been treated in the RUB clinic using this method, presenting with an average bone gap length of 8 cm. The researchers say that their findings are very promising, as stem cells reduced the time required for one cm of bone to grow, from 49 to 37 days. For people with an 8 cm gap, this means that they will recover, on average, three months faster. Despite their promising results, the scientists admit that more research is required, due to their small sample size.